It wasn't a particularly tense weekend despite some serious competitors with serious goals on yesterday's FEI 100-mile ride - maybe it's the wild west setting out in the boonies - but today was particularly casual, more like a group of people getting together for a trail ride. After finishing her 100-mile ride on Jazzbo last night and getting to bed around midnight, Nance Worman saddled up Quinn this morning and was in the saddle by the 7:30 AM start time, looking pretty darn good. Just nine other 50-milers hit the trail today, while many riders and crew started packing up for a leisurely departure for home. Connie was one of 50's, riding her beloved Phinnaeas, after he had a day off yesterday. Gretchen hadn't planned on her two horses doing three days of the ride, so Steph gave us two of her horses to ride today, Rhett and Quickie. I took Rhett, because I expected he would be a handful, and Gretchen got to ride Quickie. 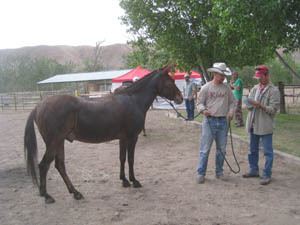 The gray mare is half Arabian and half Orlov trotter, and man can that horse trot. She can trot as fast as some horses gallop. Our original thought was to drag ride and close gates, and maybe pull ribbons, but I realized that unless we started an hour behind everybody, Rhett wasn't going to have any part of going slowly or pulling ribbons, (he won the 50-mile Eagle Extreme two weeks ago with Steph), and Quickie does not specialize in standing still, especially if somebody is leaning off her sideways to pull ribbons off sagebrush. So, unless we wanted to walk the entire 15.5-mile first loop on foot, we would be taking Steph's advice, "Go on out there and have fun! Just ride!" I didn't want Rhett to go TOO fast though, so we let the 13 other starters leave without us. 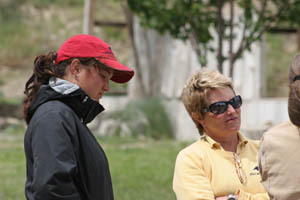 One of them was Rachel Gregson, riding another of Steph's horses, Rushcreek Mac. Mac is an underling to Rhett, and I am sure Rhett was well aware that Mac was ahead of him. An insult! Another of the riders was Laurie Wells, doing her first LD ride. She'd done the Trail Ride on Saturday, and she was a bit nervous about her first LD. She was in good company, however, riding with her husband. 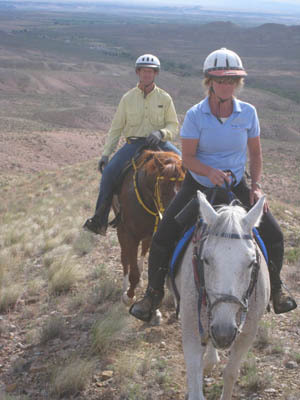 Gretchen and I thought we were last, until Bruce Worman caught up with us as we walked out of camp on the trail through neighbor Carol's Lost Juniper Ranch, passing right by her three golden babies by her cremello stud horse, LJ Owyhee Moonstone. On the first day of the ride when everybody rode past, the babies were scampering around and around their paddock. Today they were all sacked out by their mommas, totally unaffected by and broke to a herd of horses riding by. Bruce's daughter had planned on coming today and riding the LD with him, but she didn't make it, so he was stuck with us on this first loop. I took a big chance leaving camp, snapping Rhett's reins on the least severe rings, and, without anybody in front of him, I had no trouble keeping him to a low roar. I did still have to keep both hands on the steering wheel most of the time just in case, so I didn't get too many pictures on the loop. 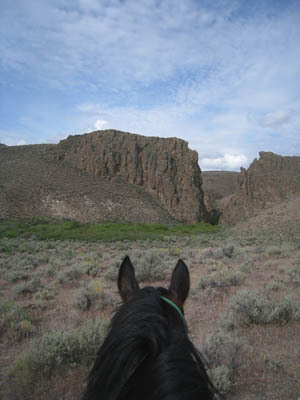 Hart's Creek loop is probably the most spectacular trail of the Owyhee rides. 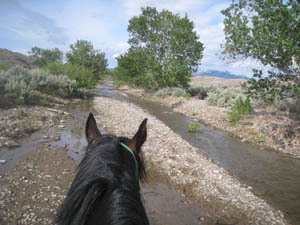 The trail leads east of camp, along a sandy wash into the Harts Creek valley, winding along cow trails through tall sagebrush - Rhett had a ball flying through here - until it dropped us into the creek. We crossed the flowing creek twice before reaching the 'Homestead,' where a local family lived in the early 1900's, till one of those hundred-years-floods came and washed their home into Oreana proper, maybe sometime in the 1960's. Some old stones from the foundations, and old corrals are still left under the locust trees that still stand guard over the place. Cow trails led us right up to the base of the tall narrow canyon from which Hart Creek emerges. We turned right just before it, and began slowly working our way back up onto the plateau above the creek. We followed wash, then began a little hill climb, which ends on a somewhat steep narrow ridge. As we were climbing, we saw a line of riders on the top of the ridge ahead of us, framed by baby thunderheads. Once the ridge is attained, it narrows considerably. 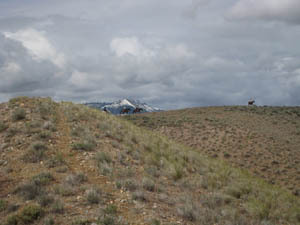 On the right is a drop into a fold in the hills that rises to eventually meet the ridge; on the left is a steep drop into Harts Creek, which is now a couple of hundred feet below; behind is the broad Harts Creek valley ending in the far distance at the canyons of the Snake River; ahead are the still-snow-covered peaks of the 8000-foot Owyhee Mountain range, where storm clouds were brewing. 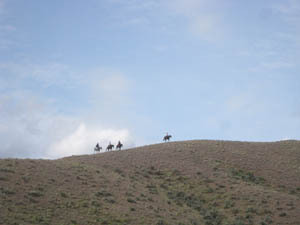 It was another cool morning, but our horses worked up a good sweat by the time they reached the top of the ridge, which became the plateau and the trail for home. We'd had a nice relaxing ride so far, Rhett deciding on how fast or slow he wanted to go... but now, we were turning for home, and now, he could see 4 horses in front of him, including his stablemate Mac. Uh oh. Pack the camera away: no more pictures till the vet check. I rode him with a snug hold for a mile but before we made that last turn directly toward home, I knew I'd be in trouble unless I jumped off and moved his reins to the severest rings. I did just that, and I still had one big handful of one big horse, all the way home. Now it was me who worked up a good sweat, and I was huffing and puffing hard with that last 1 1/2 mile trot-strangle-hold-canter down Pickett Creek canyon into basecamp. I was really worried Rhett would get away from me and race after the 4 horses in front of him, blowing by them and spooking everybody, probably dumping me off in the dirt in the process (although if that happened, I might have bailed). And so I was very glad to take the optional little flagged detour off the road in the last half mile, to use it to slow Rhett down. Only thing was, he was so miffed I wasn't letting him gallop home on the road, he almost dove off the little cliff over Pickett Creek instead of following the trail - twice! I sure was glad that I was able to hop off Rhett of my own volition as we came into the vet check, and I was glad to give my muscles a rest and catch my breath! Our horses were all down when we arrived, and we vetted through quickly, with the group of 4 other riders who'd come in just ahead of us, and Bruce who came in with us. I made sure Gretchen and I left on our last 9-mile loop exactly on time, and the other riders must have been a little late, which I was pretty ecstatic about, because I didn't want to go blowing by anybody out of control on this loop, either, and this loop was a training one Steph and I had been over on Rhett and Jose a few times at a good clip. But Rhett had nobody in front of him for a while, and he cruised along quickly on a loose rein, with Quickie easily keeping step behind him. Sometimes he chose to walk, which was fine with me, even when Morgan Olson and his mule Jackson appeared in front of us. 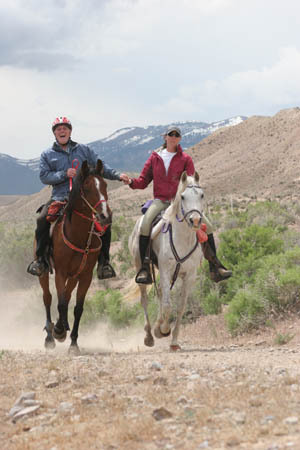 Once the trail took us up onto the southeast plateau (where Rhett likes to cruise), our horses moved right on out, quickly catching up with Morgan and another rider. They let us pass, and we let our horses roll on as they pleased. It was fun for Gretchen and me; when we ride her horses we are used to small striding little Arabians, so this was a different kind of ride - fun, fast, and (at the moment) in control! We got off and walked our horses down the hill at the end of Pickett Creek, then got back on for the last mile and a half home. I was so very pleased with Rhett, we were trotting or cantering easily along in hand; he wasn't pulling, I wasn't pulling (or gasping for breath), and Gretchen was having a great time behind me on Quickie. 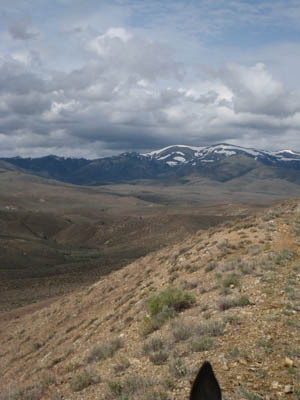 We came to the optional flagged trail through the sagebrush, and from behind me Gretchen called, "You want to take the trail or the road?" I said "We'll take the road, since Rhett is being so good!" And he was; the closer we got to home, his pace stayed the same. 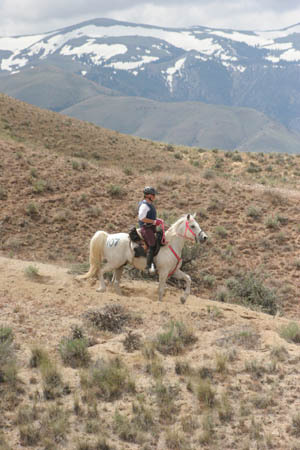 We got off and walked in at the very end of the road, and our horses were already down when we got to the pulsing area. We lingered there letting the horses have some hay, and were about to go to the see the vet, when Regina and the others at the in-table said, "You have to go back out, you missed some trail!" We did!? Well, OK, we can go back out, we thought they were joking. For real... but where could we have missed the trail? How far back? Which loop? Maybe we can just go do the whole loop again, it really was fun! We missed trail - really!? "Yes, that last little detour off the road!" 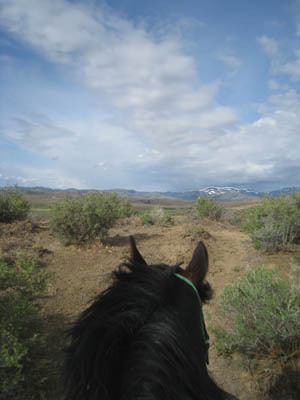 Well, Gretchen and I really didn't mind going back out and loping that last bit in again, because our ride goal today was to have fun, which we were - though Rhett and Quickie didn't know what the heck we were doing. Besides, even though they finished the ride (well... not yet!) 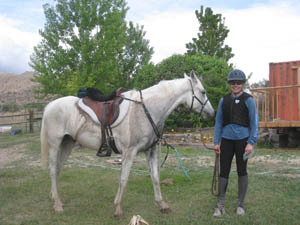 they were not finished being ridden; they were taking Leonard and Scarlet de Rodas out on a little trail ride afterwards. That Rhett and Quickie would understand, after seeing the vet and eating during a rest stop, but this turning around to go right back out on the trail was clearly a bonehead idea by their bonehead riders. I was afraid Rhett would be so mad that he'd take off with me for real this time coming back in for the 3rd time, especially if he could see horses in front of him (like Mac), but there was nobody in front of us, so Gretchen and I had one last fun zip into camp, the successful conclusion of her Riding-with-Merri-Fix for the summer. On our last little jaunt, we puzzled over who we'd heard say we could take the road or the sagebrush detour, when finally it came to me - Steph said it, at the first ride meeting! She'd made the detour because the road had become so rocky after grading it, but the detour turned out to be a bit rocky itself, so we had a choice. Maybe I was imagining it, but Gretchen heard something like it too. "It was YOU!" I said to Steph when we got back. She said, "It was?" She couldn't remember - and that after all the raking Connie and I (especially Connie) did! Maybe Gretchen and I both imagined it. But we all had a good laugh anyway. 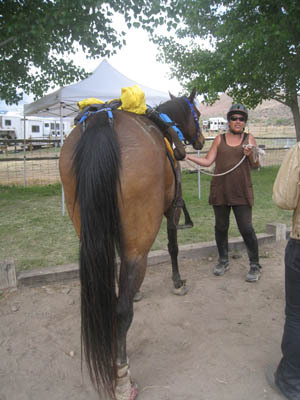 The bigger laugh would come later in the 50-mile ride from Connie... but first, we unsaddled Rhett and Quickie and vetted them in, then saddled them right back up for their trail ride. The rest of the LD riders came in, including Laurie Wells... by herself! Her husband was pulled at the first vet check, so she was left to do the last loop on her own. She was happy to have successfully gotten her first LD out of the way, so she won't have to worry about it anymore. That makes her an old hand at her next ride, right? The thunderstorms were gathering again in the afternoon, one particularly heavy one hanging over the northern flats, which was convenient, since today's entire ride looped around the southern flats. Good thing, because there were some serious lightning bolts dropping over that way, as we waited for the first 50-mile riders to come in. The first two came cantering across the line together: one of yesterday's Ground Jury, Scotsman Clive Pollit, and Colorado tornado-runner Tennessee Mahoney - one more rider who attempted, and completed, the 'Triple' - the 50 on Saturday, the 100 on Sunday, and the 50 today. Tennessee's horse DWA Pearl also ended up winning Best Condition. Nance Worman crossed the line in 5th - the only other rider to complete the 'Triple' - make that a Double 'Triple,' as Nance did the same thing last year on her two horses, Jazzbo and Quinn. Quinn and Nance completed Tevis last year; yesterday was Jazzbo's first 100, and she is aiming for Tevis with him this year. I kept expecting Connie and Phinnaeas to come in, but it wasn't until much later, after 6 horses finished before her, that they came in. "Where have you two been?" I asked. "We got lost!" Well, they didn't get lost, but they missed some turns, and they also started out on one of the loops wrong. "I've done just about everything wrong today that I could do as an endurance rider. I don't have any more to mess up!" She figures she and Phinneas did about 60 miles today, and she was blown away by him, because he was willing to do whatever she asked, all day long, even when she had to turn him around and go back to camp and go straight on out of camp on the correct trail. I did notice, however, that Finny did not readily give her any kisses at his final vet check. She had to beg him, and he took his time considering, but of course he handed out the kisses as soon as she brought out his Happy Meal. 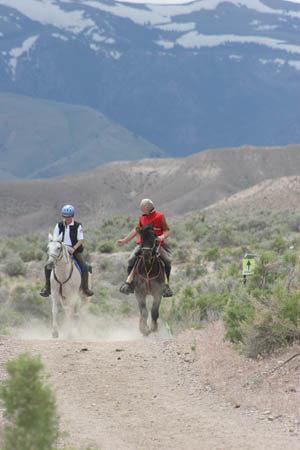 Beth Bivens on WRF Prince Niles, and Tom Noll on Frank, were the final riders in, bringing to a close the 3-day Owyhee Fandango. We had a miniature ride meeting - after John rang the loud dinner bell one more time - the few remaining campers gathering in chairs on the deck to hear the finishers and collect their completion awards, and to tell a few stories. It was a successful jaunt for almost everybody - from those who hauled in from down the road, and those who came from across the country and across the world; from those FEI riders aiming for Malaysia to the trail riders; from those who rode every day to those who came to ride one day; from riders who have 19,000 miles to those who completed their first or second Limited Distance ride; and from those horses who have 5000 miles to their name, and to those with just 25 miles to their name. It's always a good group we have here in the Northwest, and this year we Fandangoed with old and new friends from around the world.